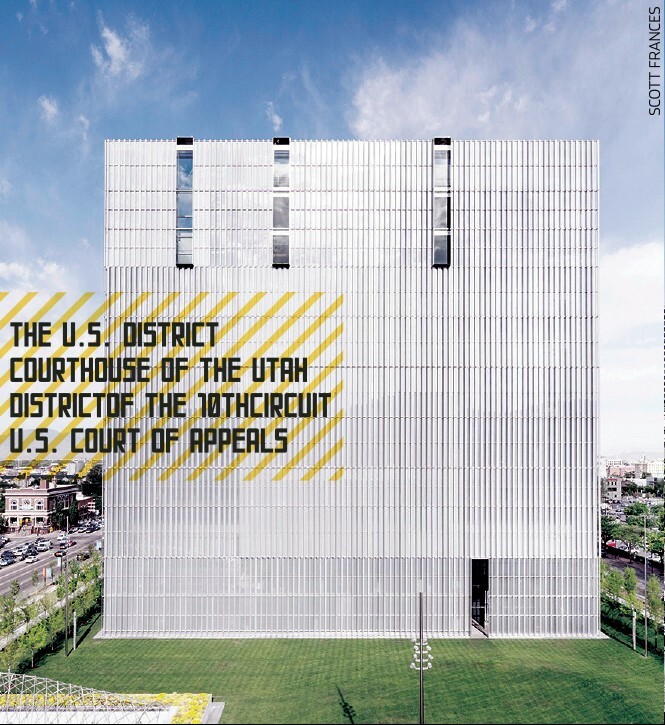 How Utah ended up with a Borg Cube for a Federal Courthouse. Architecture normally receives very little public notice in Salt Lake City. Whatever else one may say about it, however, the new federal courthouse got the public's attention. When it opened in 2014, response was massive and critical. The Salt Lake Tribune and KSL Channel 5 received a wave of letters and posts in response to articles about its opening. The overwhelming consensus was that the building was "ugly." A few commenters on KSL's website were more creative, comparing the building to "a big swamp cooler," "a gigantic air conditioning condenser" and "the Justice Dumpster." These comments draw attention to the courthouse's most prominent aspects: its free-standing cubic form and metallic materials that evoke a piece of technology. Moderated2: "Is this where the NSA charges you after they tapped your phones, PCs, email, etc.?" Seeker3: "This gives the Federal Government more of the image that it does not need. Bizarro World." Stmghowell: "...the nauseating horror of the outside appearance is an explicit representation of the stupefying inefficiencies of the modern-day courtroom system and the brutal injustices that can occur there." Architects, on the other hand, were largely approving. In 2015, the courthouse was given a prestigious Honor Award by the American Institute of Architects. News of this award gave rise to a renewed flood of public comments that took aim at the art and architecture establishment. One commenter wrote, "This is the state of modern art. Something that is truly ugly and has the artistic shelf life of day-old bread is praised by elites for being some kind of masterpiece. Art no longer inspires. People design a giant gray box, fill it with art work that looks like kids splattered paint on a canvas, and then congratulate themselves on how good they did by giving themselves awards. We need true artists that inspire again." But of all the labels attached to the courthouse, the one that appears to have stuck is the "Borg cube," referring to the fearsome adversary of Captain Picard and his crew on Star Trek: The Next Generation. It is revealing that this reference should prove so popular. The Borg, you will recall, traveled in a ship in the shape of a cube that contrasted dramatically with the sleek form of the Enterprise. They were not individuals but members of a "collective," like bees or ants. They were visibly parts of a machine, disfigured by the addition of various technological prostheses—most prominently around an eye, one of the "windows to the soul." Their threat to those outside of the collective was that they would be "assimilated"—that is, become Borg and lose their individual identities. The Borg embody a type of dystopian future myth in which the individual is eradicated by an impersonal society. In one sense, they recall George Orwell's novel 1984 that evoked the insidious rise of totalitarianism and its subjugation of the individual to the will of the state. This resonates with many Utahns' distrust of the federal government, a collective Utahns fear will "assimilate" them by such means as imposing universal health care and educational standards. The Borg myth resonates with another Utah preoccupation as well. The Borg are the product of reason run amok. The cubic shape of their spaceship symbolizes this unbridled reason. Their "collective" demonstrates the danger of allowing reason to rule morality, taking the utilitarian maxim "the greatest good for the greatest number" to its supposed logical conclusion. In the Borg myth, it is not totalitarianism but reason that eradicates the individual. Labeling the courthouse with the term expresses a distrust of reason as a guide to life. If the popularity of the "Borg cube" reference is any indication, the exterior form and materials of the courthouse has triggered a strong visceral reaction in a substantial number of locals. If any proof is needed that architecture can create powerful symbols, here it is. One hundred eleven years ago, the design (if not the location) of the first federal courthouse in Salt Lake City created little controversy. At the time, there was widespread agreement about the design of courthouses and other public buildings in our country. The ideals of the American Republic were usually represented by stylistic references to buildings of the Roman Republic of 2,000 years ago, a practice begun by Thomas Jefferson in his design for the Virginia State Capitol in 1788. The Frank E. Moss U.S. Courthouse in Salt Lake City, completed in 1905, was built in this tradition, with its imposing colonnade towering over Main Street. Originally known as the U.S. Post Office and Courthouse, the venerable structure was renamed in 1990 for the late U.S. Sen. Frank E. Moss. Soon after it was completed, the idea that modern society was not well represented by imitations of ancient architecture began to gain support among architects and the public. The search for new architectural ideas began and continues today. Today, there are many ideas about what a public building should look like, just as there are many ideas about the state of American society and the direction it should take. Due to this diversity of ideas, a modern public building can no longer be a simple profession of faith in our founding principles. Today's best public buildings illuminate some idea of what these principles mean now. Public buildings that are not banal are almost guaranteed to be controversial, and an architect who wishes to avoid banality must be something of a political philosopher. The social context of public buildings is not the only thing that has changed about them since the early 20th century. Physically, a modern courthouse is a very different animal than a traditional one like Moss. Modern technology makes buildings more convenient and comfortable. The trade-off is that such technology takes up more space and places more constraints on a building's layout. Whereas traditional courthouses had heavy masonry walls with relatively small windows, a modern one has a steel or concrete frame enclosed by a lightweight curtain wall. This allows much larger openings and more daylight. (In fact, increasing the amount of daylight in the new courthouse was one of the first things the judges asked for after years of working in the relatively dark Moss building.) The number and diversity of activities that take place in a modern courthouse are far greater than before, adding significantly to the challenge of laying out the building. Last but not least, security has become a major factor in the design of all public buildings. 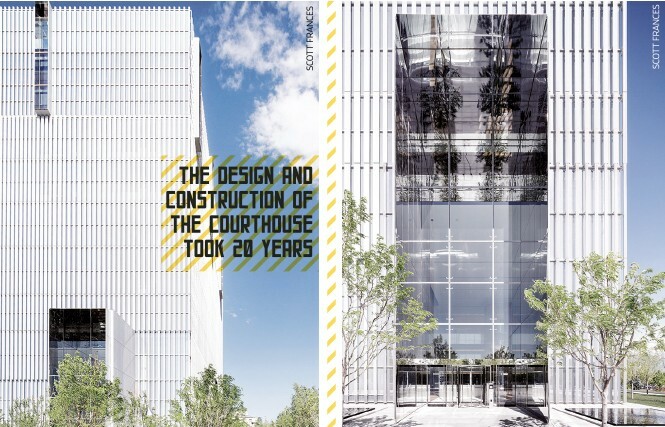 The combination of social and technical challenges in modern courthouse design poses a conundrum when it comes to choosing an architect, as few architects are equally accomplished at both kinds of thinking. The General Services Administration (GSA) is the agency responsible for the federal government's non-military buildings. It is a mammoth organization that owns and operates around 9,600 buildings totaling nearly 400 million square feet. Given its vast portfolio and the complexity of modern buildings, the GSA used to give priority to technical competence in choosing its architects. The result, according to Ed Feiner, a former chief architect of the GSA, was a large number of uninspiring buildings. After becoming GSA's chief architect in 1981, Feiner decided that federal buildings should showcase the country's highest ideals through their design. In 1995, he initiated the Design Excellence program, changing the way the GSA chooses its architects. Under Design Excellence, a list of about five is created for each project based on their individual design talent, according to Feiner. Each of these architects is paid a nominal fee to assemble a design team and come up with a design for the project at hand. The designs are judged by a group of respected architects and GSA employees familiar with the project. The winning design is chosen, again according to Feiner, for the overall approach each designer takes, and this architect is awarded a contract for the project. Feiner emphasizes that the purpose of this selection process is to "choose the architect, not the design." Since the requirements of a building project often change over the course of the design process, a submitted design will probably not be built. However, he believes that having the right architect ensures that a good building will result regardless of changes that might occur. As we will see, adaptability certainly proved to be an essential trait for the architect of the Salt Lake City courthouse. Putting the individual designer at the center of the selection process has important consequences. By winning the competition, the architect gains the GSA's approval of his or her design judgment before the project begins. This puts the architect in a strong position to set the project's direction and make subsequent decisions. For the Salt Lake City federal courthouse, this process resulted in the selection of Thomas Phifer of New York City. Phifer had worked for many years in the firm of Richard Meier, a world-famous New York architect widely admired for his modernist designs. Since this stylistic preference was apparent in Phifer's winning design as well as in his previous work, it was a given at the outset that the Salt Lake City courthouse would have a modern appearance. But this alone does not account for the building we see today. A little history of the project is needed to understand how the building came to be what it is. 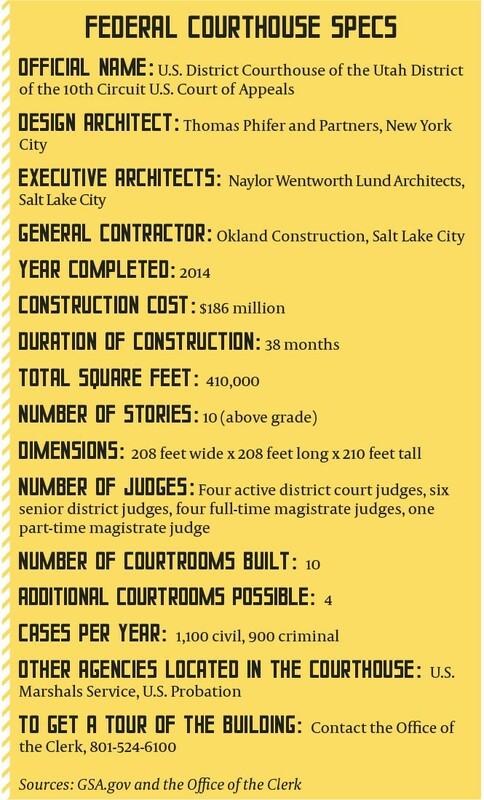 Designing and constructing the Salt Lake City courthouse took almost 20 years. The design competition that resulted in Phifer's selection took place in late 1996. He and his fellow competitors were asked to design an annex to the Moss courthouse, not a separate building. 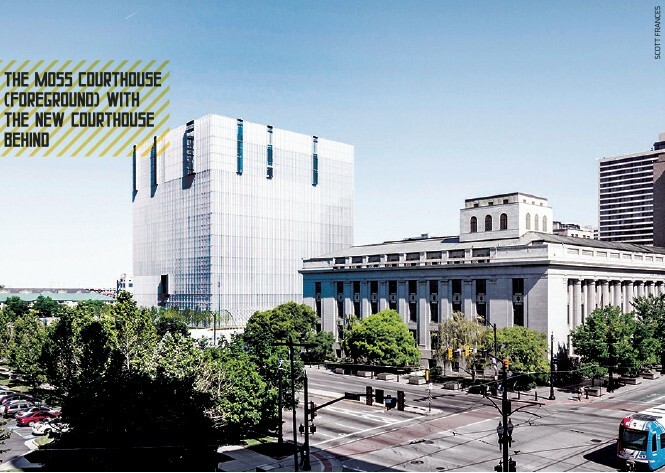 Working with the Salt Lake City firm of Naylor Wentworth Lund Architects, Phifer came up with the winning design that inserted itself sensitively into the context of the old courthouse and Market Street. It featured a building comparable in size to the Moss courthouse, joined to it by a covered atrium (see first right). 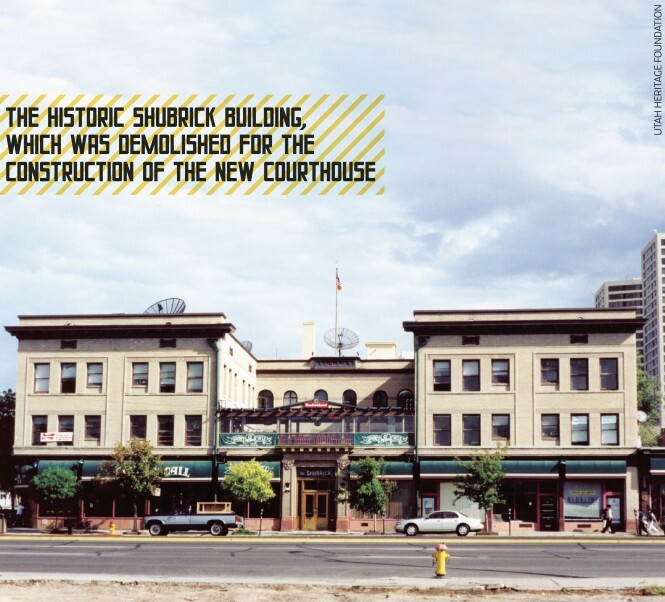 Its controversial aspect was that it required demolishing the Odd Fellows Hall, although it proposed to keep the façade of that historic building. Soon after Phifer and his team were hired, a problem appeared with their winning design. It called for keeping some of the federal district courtrooms in renovated parts of the Moss building. According to Ross Wentworth of Naylor Wentworth Lund, the layout of the old courthouse made it impossible to meet certain security requirements. The design team was asked to come up with a new design (see far right) that housed all of the courtrooms inside the new structure. The new design featured a larger but still low-rise annex building, now separated from the Moss by an open plaza. A problem remained, however, with the proximity of the new building to the street and to nearby buildings. According to Alan Camp, the GSA's project manager for the new courthouse, large setbacks were mandated around all new federal courthouses. This is to prevent a bomb-carrying vehicle from approaching the building, as happened tragically in Oklahoma City in 1995. Camp says that these setbacks could be modified if the federal district judges agreed. For reasons that are not clear, it took a considerable amount of time to reach a decision to maintain the setbacks. In the meantime, Wentworth says, the design was developed to a fairly high degree of detail. The second design finally went the way of the first, and it was, as they say, back to the drawing board. After a few false starts, the judges and the GSA decided that the security requirements could only be met if the courthouse had the block to itself. It took several years of negotiations and congressional intervention before the historic Shubrick Building at the corner of West Temple and 400 South was finally acquired, which caused the closure of many of the businesses located there, including the popular nightclub, Port O'Call. The former City Weekly offices, located on 400 South, were vacated and the paper relocated to Main Street. During this time, the Odd Fellows Hall was moved to a new location across the street, also with federal financial assistance. Phifer's team started again with a clean slate in 2005—nine years after winning the commission. The team proposed three designs. When asked why the cube design was chosen, several people mentioned the efficiency of the form—a cube encloses a given volume of space with a minimum of wall area, assuming flat walls. This saved money in construction and reduces the cost of heating and cooling compared with the other designs. While true, this has a whiff of rationalization about it. The walls as built were made more expensive by a custom-fabricated system of shading louvers. A larger wall area could have been built for the same amount of money with less expensive construction. Relatively efficient heating and cooling was achieved through a variety of means, but the inherent nature of the design—a glass cube—was an obstacle to be overcome, not an argument in its favor. The efficiency argument is not convincing. There must be another reason why this design was chosen. "Architecture is the masterly, correct and magnificent play of masses brought together in light. Our eyes are made to see forms in light; light and shade reveal these forms; cubes, cones, spheres, cylinders or pyramids are the great primary forms which light reveals to advantage; the image of these is distinct and tangible within us without ambiguity. It is for this reason that these are beautiful forms, the most beautiful forms. Everybody is agreed to that, the child, the savage and the metaphysician." This summarizes a central tenet of modernist aesthetics still shared by many contemporary architects all over the world. But while this helps explain the architect's proposal, it does not account for its acceptance as the design of the building. Architects need the support of their clients to carry a design to completion. Although the GSA hired Phifer and funded the project, their mandate—according to the GSA project manager Al Camp—is to serve the judges. These men and women were the true clients for the courthouse. Crucially for the outcome, the chief judge at the time and co-chair of the committee working with the architect was Judge Tena Campbell. Along with Judge Samuel Alba, Campbell represented her colleagues in guiding the design. She says that while the two of them consulted periodically with other judges, they made most of the day-to-day decisions. By the account of several people involved in the project, Campbell's judgment and personal relationship with Phifer were in large part responsible for the latter's ability to realize his vision. In an interview with City Weekly, she referred to Phifer as a "Picasso architect," indicating her respect for and deference to his design sensibility. Having seen his previous work, she knew in advance that he would design a modern building and thought it made sense to "let him do what he does best." With Phifer and other members of the design team, she and Judge Alba toured many courthouses around the country, gathering ideas for their building. They were especially struck by the effects of sunlight in some of the buildings and decided that theirs would provide as much daylight as possible. She says that Phifer was very receptive to this request as well as others the judges made: wood floors, a spiral staircase, using different types of wood on different levels, water pools and other features. Campbell is very pleased with the completed building. The light, she says, affects her mood and makes the building an "easy place to work [in]." Jurors, in particular, are much more comfortable in the new building, she says. This is due in large part to amenities such as video screens in the jury box and well-appointed jury rooms, but also speaks well of the design team's—and the judges'—attention to detail. Campbell is candid about the importance of security concerns. She recalls with obvious discomfort how, in the Moss courthouse, she and other judges could find themselves riding in the same elevator with someone they had just sentenced to prison. It took some time, she says, for her to understand that the security setbacks could not be created if other buildings remained on the block. Nevertheless, she believes that the courthouse is neighborhood-friendly, thanks to planters, trees and steps that are a traditional feature of courthouses. Daylight is indeed the predominant theme inside the building. While it may appear solid from the outside, the interior is bright with expansive views in every direction. Light is brought into the center of the building by an atrium and glass floors. An installation of suspended hexagonal mirrors by artist James Carpenter that hangs in the atrium varies the light and reflects it outward. Phifer sees light not only as beneficial for the work of the courts, but as a symbol for the ideals of the justice system. "Light is enlightenment," he says, "a metaphor for showing the way, for justice." He believes this is true of the exterior as well. He likes the way the walls "hold the light" and change with direction and the times of day and year. Making a glass building in Salt Lake City that doesn't alternately roast and freeze its occupants was no easy feat. In the hands of an architect like Phifer, however, this seeming liability became an opportunity to add richness to the simple form. The surfaces of the cube are subtly varied by metal louvers and glass treatments. The vertical louvers are angled differently on the four sides to deflect the sun. They are assembled in panels of varying width, covering more or less glass depending on the direction they face and the sensitivity of each interior space to sunlight. From a distance, they form a screen that lends the building its metallic appearance. Come closer and they become lacy columns that vary in width over the height of the building. From up close or inside, they are opaque or transparent depending on the angle from which they're viewed. The glass is treated with fritting (opaque ceramic dots fused with the glass) that reduces the amount of sunlight that enters the building. The dots are spaced closely—reflecting the most light and heat—on walls receiving the most sun and are more widely spaced on others. The variations in the louvers and fritting create areas that appear darker or lighter from a distance. Look carefully, and you can see from outside the locations of the lobby, the hallways, the courtrooms and the offices. Perhaps the best effect can be seen from across the street, where the louvers appear to wrap a box of sky reflected in the glass. So a Borg ship this is not, although this perception of it remains significant. Architecture can be a mirror in which people see reflected their own views and attitudes. Those who see the courthouse as the Borg ship probably approach the building with ideas about the government or the justice system they are looking to confirm. On a passing encounter, the building obliges—its pure geometric form, its isolation, its relative uniformity and its industrial materials—combine to reinforce an image of the government as remote, impersonal and threatening. But look closely, or better yet, go inside, and an entirely different impression emerges. What at first looked solid becomes transparent, what at first appeared dumb becomes articulate, what at first seemed inhuman becomes humane. One sees that the building does not lack humanity—quite the opposite— but that it takes some time and attention to appreciate it. But should a public building demand such an effort in order to be understood? Most buildings today do not require or reward such an effort. They communicate like billboards. Their messages are clear and quickly grasped; here you buy food, here you go to school, here you work, here you live. We have standard images of what each type of building should look like and most buildings conform closely to those images. The history behind the neoclassical design of the Moss courthouse has been largely forgotten; it has become a sign that says, "Here is the court system," or, "Here is the government." The new courthouse is not a billboard; it does not announce its function. Perhaps this is a failing—why not speak the language everyone understands? But what do these building-signs really tell us? In relying on stock images, they don't get us to think about what they represent. When Jefferson inaugurated neoclassicism as our national style, he knew, and his more educated fellow countrymen knew, what that style signified: the historical example of a great republic that they hoped America would grow to become. But even if people today understood the reference, would we still look to ancient Rome as our ideal? It was a slave-holding society that ruled the world by military force and imposed its language and culture on every people it conquered. To many Americans, this sounds uncomfortably like a past we as a nation are trying to overcome. We need new symbols, new points of reference, that capture our current aspirations. The new courthouse attempts to do this. It says, in effect, that the future we seek will be governed by a humane rationality. It proposes a technological utopia—a society that harnesses technology to accomplish ethical as well as practical ends. And it affirms that the United States still promises utopia, albeit a different one than Jefferson imagined. This vision will not appeal to everyone. Some will recoil at the iconic representation of government power. Others will find hypocrisy in a universal, rational form representing an unequal, discriminatory society. Still others will object to the rationalism, or the faith in technology that the building expresses. But now we are asking important questions about the kind of society we want, the flaws that need to be addressed, the means of achieving our goals. We are engaged as citizens, not merely as consumers of stock images. This is what architecture can do if allowed to go beyond the repetition of trite imagery. It is also important to bear in mind that this building will be part of downtown Salt Lake City for a long time. The Moss courthouse has been in use for over a century. Our thinking about it will change over time as the city grows up around it. Perhaps Salt Lake City is growing in other ways as well, becoming more outward-looking, more cosmopolitan. If so, this building will someday appear to us as a harbinger of what is now our future and will one day be our reality. Architecture also bears witness to its time and place. The decisive role security concerns played in its design makes the Salt Lake City courthouse a visible sign of our anxious times. The isolation from its surroundings is a tangible result of the bombings of the Beirut marine barracks, the Nairobi embassy, the Murrah building and World Trade Center. It is a reminder of—and almost an inadvertent memorial to—these tragedies. Under the circumstances, a fortress-like building would be a logical response. The courthouse appears to be just such a building until it is experienced more closely. Then, the daylight, the transparency, the thoughtful accommodation of the judicial process and the finesse of its construction bespeak our confidence in the civilization we have built. David Scheer earned his architecture degree from Yale in 1984 and has been a practicing architect for more than 30 years. He's published articles as well as a book, The Death of Drawing: Architecture in the Age of Simulation, about the effects of digital technologies on how architects think.